I love when a new recipe directs me to an ingredient I have never heard of or worked with before. There’s that moment of fear at the market when you say the name out loud for the first time, wondering just how horribly you botched it’s pronunciation. There’s a prickly moment of anticipation when you begin to cook and again when you taste it, knowing you may have completely screwed up, rendering it nearly inedible. Finally, there’s the moment when you serve it, smiling, to your dinner guests and tell them it’s quite possibly the best thing you’ve ever tasted, hoping desperately that they’ve never heard of it before either*. This is cooking at it’s best. This is “What I Haven’t Cooked Yet” is all about. I love nothing more than trying new things, taking a chance, failing miserably sometimes, and getting right back on that figurative horse. It’s the only way you learn, and there is joy and fellowship in sharing these adventures with others. 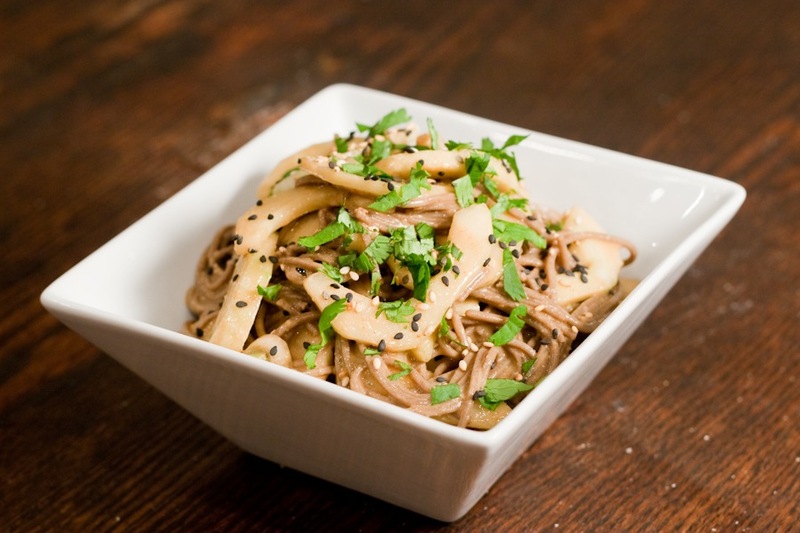 So grab some soba noodles – Japanese buckwheat pasta – rich, dark, Japanese tamari soy sauce, deep, roasted sesame oil and that odd beast, fresh, unsalted peanut butter, with a skim of oil over the top, and make this wonderful cold summer salad. Feel free to get it wrong a few times, but each time you bring it to the table smile, tell them it’s magnificent, and enjoy every minute of your time together. *This, of course, is significantly more fun if you’ve just laid down the weekly grocery budget for something like dried porcini mushrooms or a rack of lamb. Soba noodles are cheap. *The oil separates and rises to the top in fresh peanut butter. Just stir it into the jar before using. You can find organic brands like Teddy Bear on your grocery store shelf. If you are allergic to peanuts, try Tahini, a toasted sesame seed paste, or another nut butter. **Brand new from Sapore. The vinegar is actually fermented honey. OMG! You can substitute 1 tsp chili oil and 3 tbs rice wine vinegar which will give you similar heat, mild acidity and sweetness. Cook noodles by adding the package to boiling, unsalted water. When al dente, drain and rinse with cold water. Make the dressing: Thin the peanut butter by whisking it with 1/4 cup warm water. Whisk in tamari soy, sesame oil and Serrano Chile Honey Vinegar (or chile oil and rice wine vinegar). Add Sriracha to taste and dress salad. Start slow and make sure you don’t overpower the noodles. Serve topped with cucumbers, fresh cilantro and sesame seeds. Raw kale is a current darling of the food scene, and kale salads have appeared on hip restaurant menus across the country. Why? Well, it’s good for you. It’s also fairly inexpensive and counter-intuitive. Hey, who doesn’t love a counter-intuitive vegetable? Here’s the problem. It’s still kale. No matter how freshly-picked those leaves are, they are still tough and still a little bitter. One solution the food hipsters have identified is to massage your kale. Now, while I love my veggies, that’s a lot of affection just to get a salad on the table. Here’s my solution: make a fresh, bright vinaigrette with just a pinch of sugar to offset the bitterness. 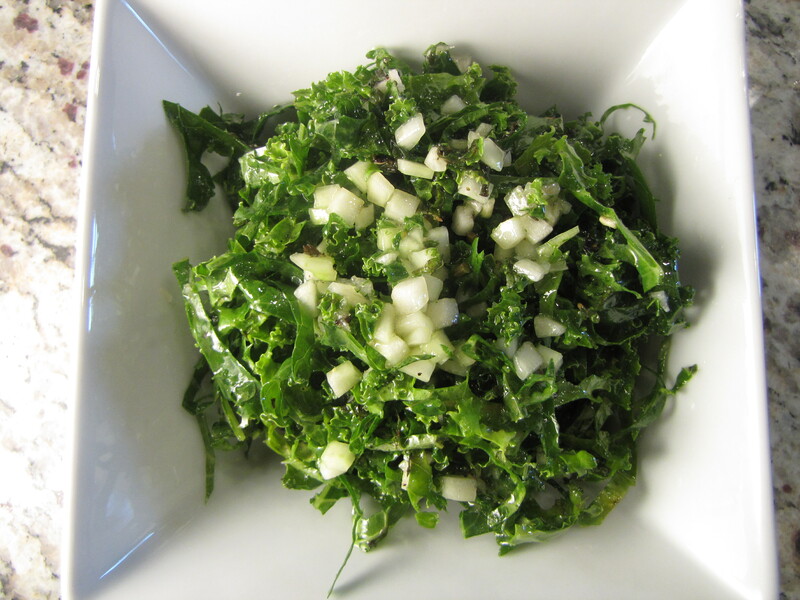 Chop the kale thin – chiffonade – and let it rest for 5 minutes after you dress it to wilt the greens slightly. That’s a salad you can love. *As some of my demo audience noted last Saturday, this vinaigrette was closely inspired by a recent tropical cucumber salad. The good news? 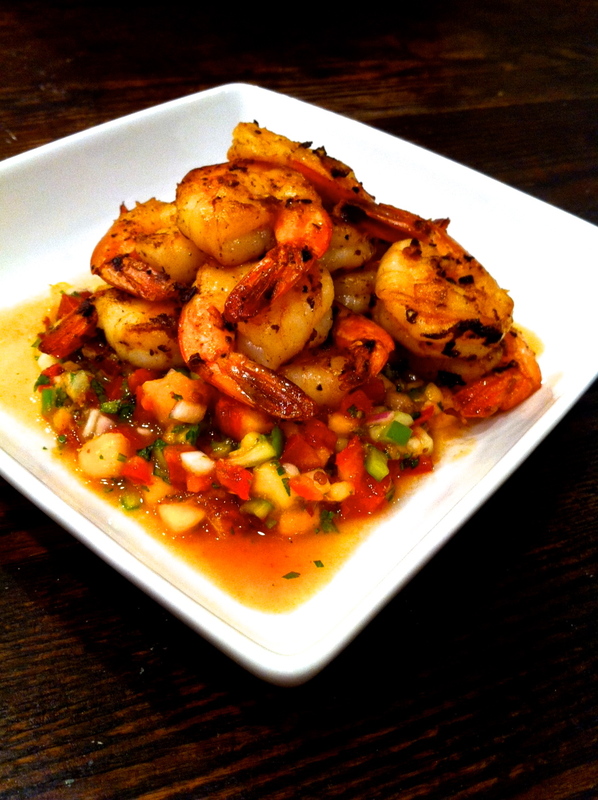 That bottle of tropical spice vinegar can do double duty! This vinaigrette would also be great over a piece of grilled fish like tilapia or over mesclun greens. *No lime oil tropical spice vinegar? You can order them online from DC’s Sapore or sub a good quality white vinegar and olive oil with 1/4 tsp lime zest and a splash of tabasco for heat. Mash garlic into a paste with 1/2 tsp coarse sea salt using the back of your knife or a mortar and pestle. Whisk together garlic paste, vinegar, cucumber and herbs. 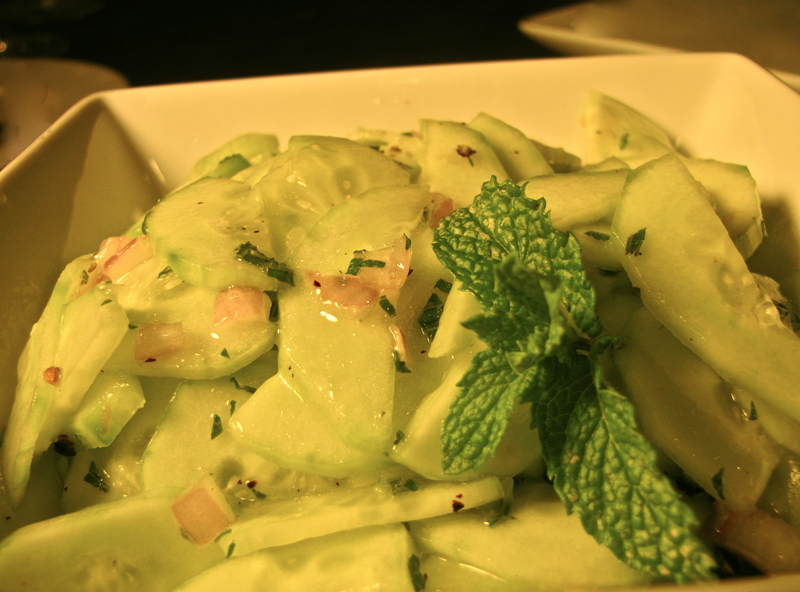 Let dressing rest for at least 5 minutes for cucumbers to soften and flavors to blend. Whisk in olive oil. Season to taste with sugar, salt and pepper. Correct vinegar and oil balance with kale. Dress kale and let rest for 5 minutes to soften. Every bit as good as you remember. Katrina and I made this soup together in the summer of 1994 in Waterville, ME. She had rented an apartment downtown off the Concourse and I drove up from my summer job, waiting tables, in Boothbay Harbor. In the thick, wet August heat we sat in the kitchen, fan humming, drinking chilled, cheap, white wine and flipping through her copy of Mooosewood, looking for ways to avoid turning on the stove. If you grew up eating healthy food in the 70’s and early 80’s you grew up with Moosewood. Your Mom had paperback copies of the Moosewood Cookbook and Enchanted Broccoli Forest on the shelf. The pages were stained for every recipe she had made from spinach-crust quiche to Confetti Spaghetti. This is where we first encountered whole wheat, honey and wheat germ. It was healthy whole food before we decided that real food couldn’t possibly be healthy. We tested this soup the other night without consulting Mollie but I think we’re close. For texture, we seeded the cucumbers, then shredded them with the box grater rather than the food processor. Thin, fresh, full-fat Amish yogurt was a perfect base. Mint and dill added brightness and a squeeze of lemon brought the tartness we were missing. We thinned the soup with water without watering it down. Testing the recipe at 10pm on a hot muggy night in DC I was back on college. Katrina, who I had not spoken to in fifteen years, had contacted me on Facebook just that day. The soup was every bit as good as I remember, and the wine was just a little bit better. Using a microplane, grate the shallot and garlic into a large bowl. 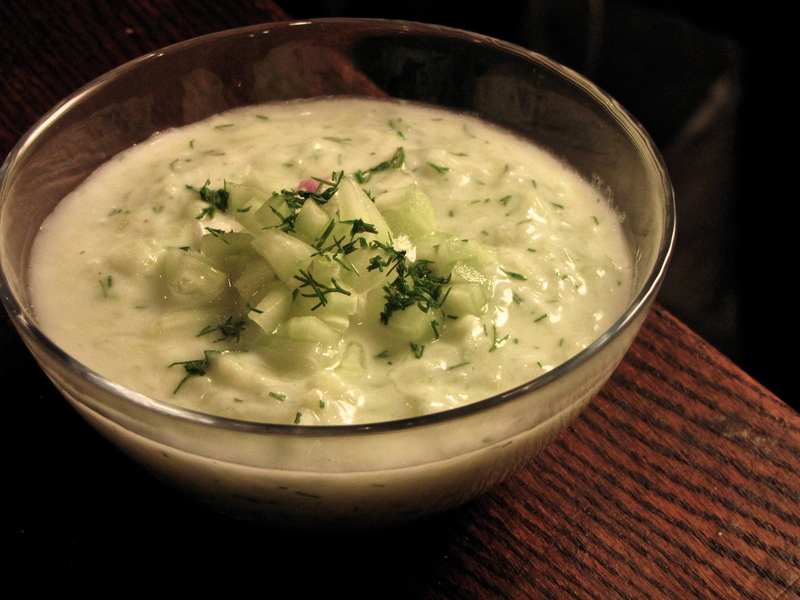 Stir in the cucumbers and yogurt. Add water to dilute to desired consistency. Season to taste with lemon juice, salt and pepper. You may not need to use all of the juice. Add a tablespoon or two at a time. 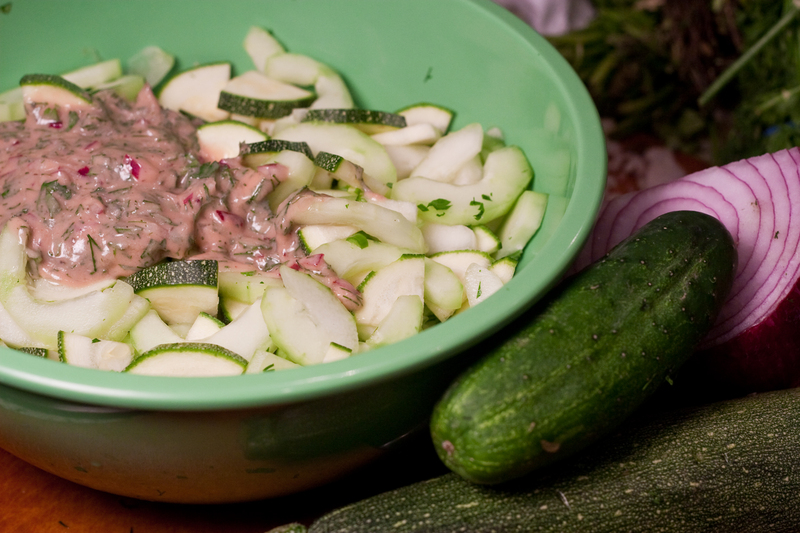 Garnish with diced onions, cucumbers. My husband, Jason, will tell you that I can’t remember what I was just talking about, but I can tell you exactly what I had for dinner on the third Tuesday of June in 1996. I’m not quite that good, but I do have a memory for meals. Many of those memories come from summer. Long, late, lazy meals with family and friends. Fresh fish with the Creelmans in Madaket, lobsters and cornbread with the Bugbees on Southport Island, my first frogs legs at Bastille Day on the beach in Newport, RI. I remember fourth of July 1998 at home making the same baked beans and ham that Gram Forgiel made for my Mom. Fourth of July 1999 was a honeydew and cantaloupe salad with ginger and honey, grilled lamb chops and a tequila, lime, kiwi chutney cooked quickly in the microwave to keep the colors bright. Summer meals are memorable because they don’t compete. There’s no thirty-day buildup, panic or planning like we have for big holidays. The meals are not grand nor the expectations high. The food is fresh, the techniques simple, and the flavors are as bright as our memories of them. This peach salsa is quintessential summer. Quick and easy – no cooking – colorful and fun, flavors light and fresh, and pairings are simple – cumin spiced shrimp, grilled chicken or pork, a bowl of crisp tortilla chips. It’s delicious. Dare I say, memorable. *The smoked olive oil from Sapore is like catching a mouthful of campfire smoke (this is a good thing!). To substitute, swap out the smoked oil and jalapeño for a chipotle chile or two. Mix peaches and vegetables together in a bowl. Stir through oil, then cumin and cilantro. Season to taste with salt, pepper and honey. The salt will bring out the flavor in the veggies, especially the fresh tomatoes, while the honey brings out the flavor in the peaches. If this makes it into the fridge before you eat all of it, check the seasoning when you bring it back out to serve. It holds up beautifully for a few days, although the colors will darken a bit. They always remind me of my childhood. Crunching through them, wet and sun-warmed right from the garden. Cold and crisp with dill and sour cream in my Mom’s salad. Moosewood’s cold cucumber soup. Mom’s gazpacho, Mom’s salad tossed with rice wine, salt, pepper and sugar, my Babci’s pickles. This simple salad plays of their cool sweetness with fruity sweetness and a little heat. If you are serving the salad right away, just slice them in half rounds, toss them with the dressing and eat, but if you are going to hold the salad for a bit in the fridge or freezer, then remove the seeds before slicing the cuckes into thin crescents. The seeds hold much of the moisture in the cukes and this is an easy way to keep your salad from turning to soup. How do you seed a cucumber? Easy! First peel it, cut off the ends, and then cut it in half lengthwise. Now scoop out the seeds with a teaspoon (the one from your flatware drawer, not the measuring spoon). Finally, if you are holding the salad, then remember that it will release some moisture, diluting your dressing. Check the seasoning again right before serving. *If you or your family prefer less spicy food, try a lightly acidic, sweet vinegar like Champagne Mimosa or rice wine. Combine mint, shallot, sugar, Tropical Spice Vinegar and a pinch of salt and pepper in a small bowl. Whisk in peanut oil in a thin stream. Dressing will become creamy. Dress cucumbers lightly, reserving extra dressing. Let salad rest for 5-10 minutes for flavors to develop. Check seasoning and add salt, pepper or additional dressing as needed. *The cucumber will release some water while you let this rest. Season to taste right before serving. 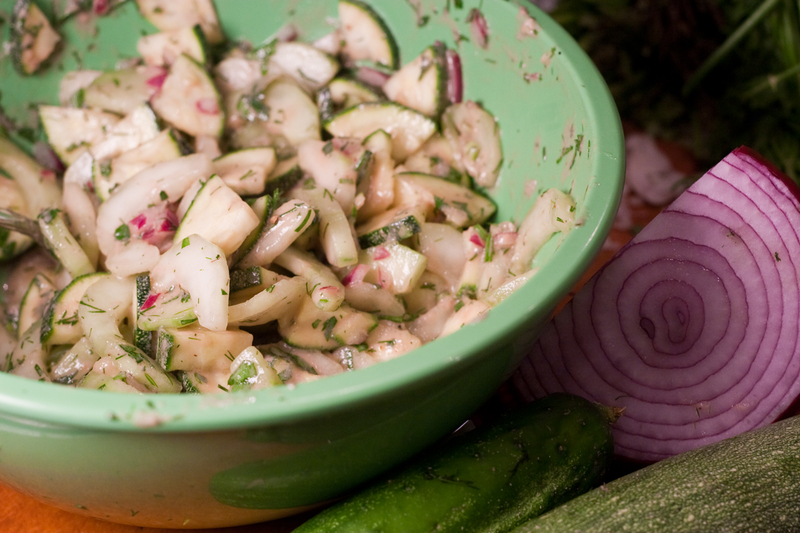 For a drier salad, lightly salt the cucumbers, drain in a colander for 15 minutes and pat dry.